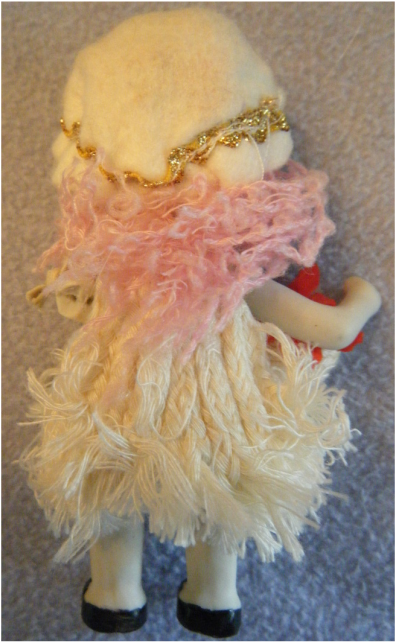 This doll was acquired at the same yard sale as the Unmarked Oilcloth, Colonial Dame, and Queen for a Day. We have not been able to find out anything about it and don't have any idea of its age. It is roughly 4-5" tall. The head, arms, and legs are bisque. The body is a hardwood cylinder about the size of a cork for a jug. The arms are strung and the legs are frozen. 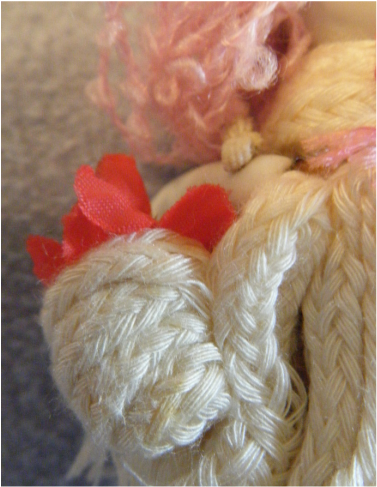 One of the unusual features of the doll is the dress made from a series of braided threads glued directly to the body. 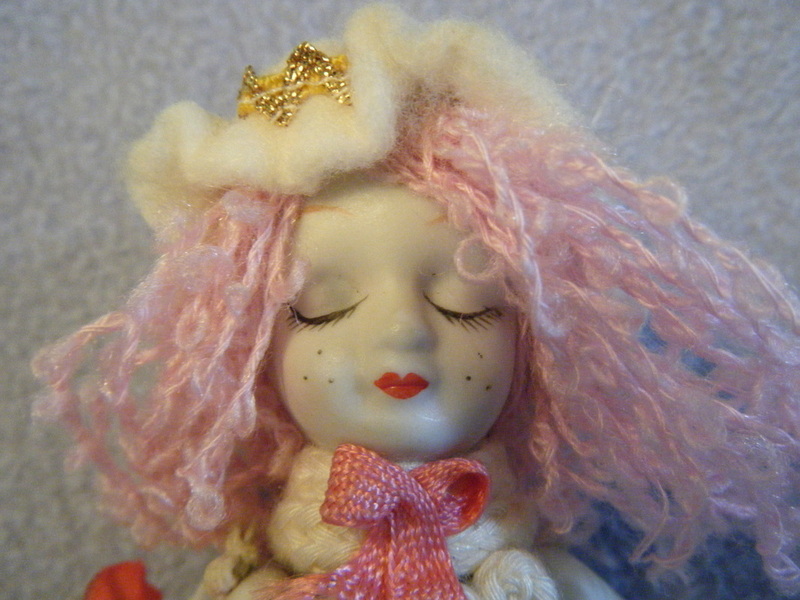 The frizzed out pink hair is made from yarn. I wonder if she was meant to represent a fairy, pixie, or some such mythical being. 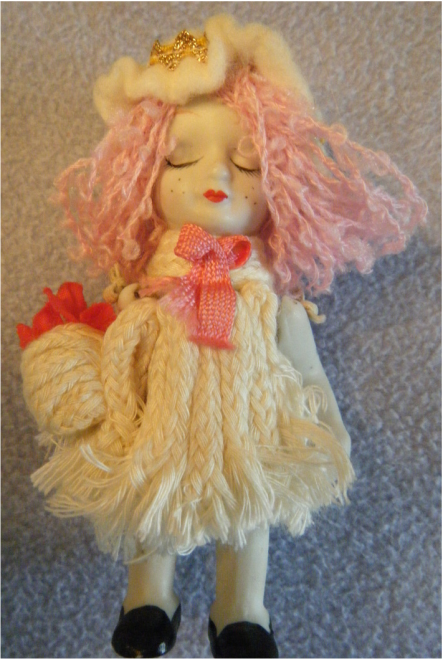 The doll has closed eyes. The eye lashes, lips, and freckles are painted with some care. 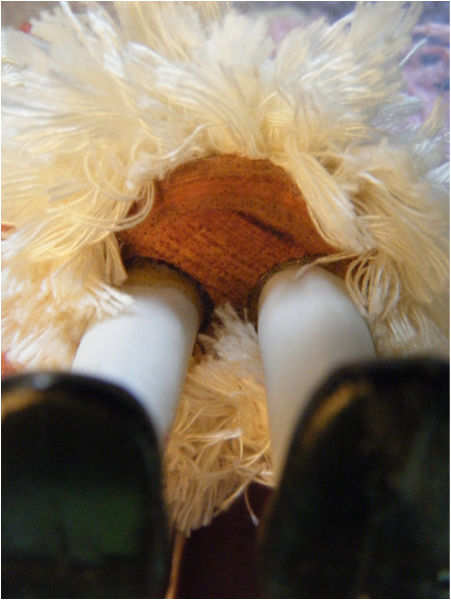 This shot shows how the legs are attached to the wooden body. The adhesive looks like epoxy. The mob cap is something like felt or a soft blanket material and is encircled with metallic gold ric rac . The black shoes (slippers?) are painted on. The same braiding used to make the clothing is wound up to form a flower basket. Perhaps the flowers represent red rose petals.